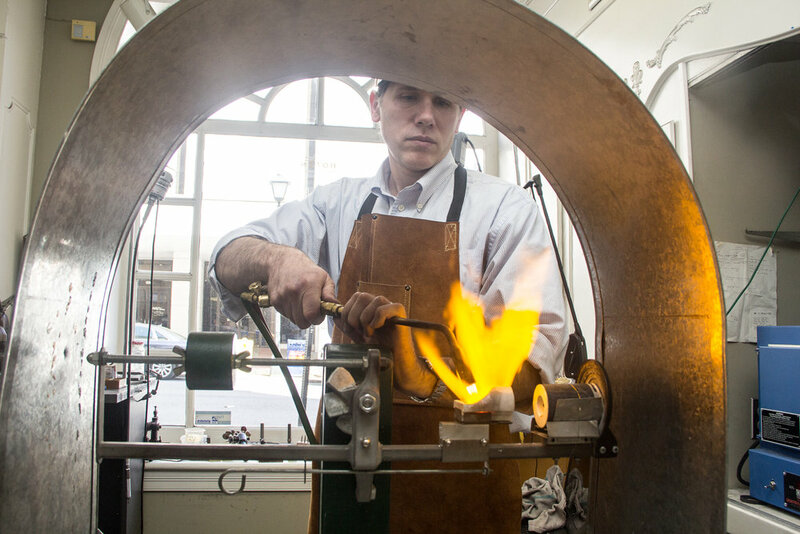 At Bowen Jewelry Company, we take great pride in offering our customers the most versatile selection of fine jewelry in the Central Virginia area! While we have an impressive selection of fine jewelry, estate jewelry, and consignment selections, we understand you may require an extra special design for you or your loved one’s jewelry collection. To ensure your fine jewelry matches your personal sense of style–and is one-of-a-kind—we offer custom design services. Our Custom Design Department consists of our lead designer and craftsman Mr. Biff Bowen, and Mr. Robert Moses. Custom designs are perfect when you desire an engagement ring that is a mixture of a few different rings you like, or when you want to turn your current jewelry into something fresh and new. Together we will design the ring, pendant, or fine jewelry of your dreams! Meet with one of our knowledgeable sales staff that will assist you with finding the design aspects you are looking for. Our in house design team will use this information to create a sketch for your approval. We can modify the sketch to further fit your desires if necessary. Once the sketch is approved, we can get started on manufacturing the piece. Our in house designs usually take approximately two weeks for completion. Once finished, the item will receive an appraisal, and be ready for your enjoyment. Contact us today at 434.845.3495 to schedule an appointment with our design team!